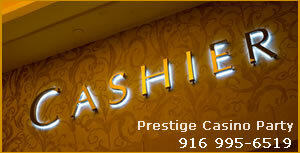 At Prestige Casino Party of Sacramento, you don’t have to use our Full Casino Party Planning Services to enjoy a Quality Casino Table for your next party or event. We also provide Casino Table Rentals, which allow you to use your own dealers. Our Casino Table Rentals still include Delivery, Setup and Break Down (a delivery charge may apply) as well as all equipment necessary to play the games.